BREWER, Maine — Old Town High School was on the brink of squandering the best scoring opportunity of a scoreless game. The Coyotes loaded the bases with nobody out in the bottom of the eighth inning of their Class B North championship game against Oceanside of Rockland/Thomaston but a grounder to short and a soft liner to second left it all up to freshman left fielder Jannessa Brown. And Brown, who had struck out twice and popped up, came through. She hooked a soft, line-drive single into left-center field to supply the defending state champs with a 1-0 triumph in a thriller at Coffin Field in Brewer. Second seed Old Town (17-2) won its 15th straight game and plays South winner Fryeburg Academy (16-3) in Saturday’s 12:30 p.m. state title game at Saint Joseph’s College in Standish. Fourth-seeded Oceanside had its 12-game winning streak snapped and finished at 16-3. Brown said she was confident and that she hit an “outside pitch” from Oceanside sophomore pitcher Chloe Jones. “That was incredible. To have her step up like that,” said Old Town junior pitcher McKenna Smith. Natalie St. Louis had opened the eighth by grounding an opposite-field single to right. Morgan Love laid down a sacrifice bunt and a throwing error sent St. Louis to third and Love to second. Smith was walked intentionally before the groundout and liner set the stage for Brown’s heroics. The game featured a pitching duel between the impressive Smith and Jones, who both turned in masterpieces. Smith had a no-hitter through 6 1/3 innings and finished with a one-hitter. She struck out 12, didn’t walk anyone and hit a batter. She threw 94 pitches, 66 for strikes. Jones surrendered six hits with 13 strikeouts and two walks, one intentional. She threw 108 pitches, 76 for strikes. “I threw pretty well. All of my pitches were working and I was able to spot the ball,” said Smith. who added that Jones was the best pitcher she has faced this season. Smith had a perfect game through five innings. Lauren Hatch was the first Mariner to reach base as she led off the sixth by reaching on an error by the first baseman, who dropped a throw. Morgan Heal was then ruled to have been hit by a pitch on a bunt attempt although there was some question whether she was hit and if she had offered at the pitch. 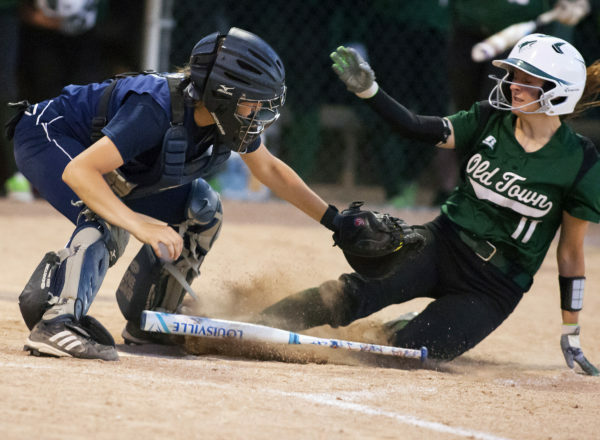 If she hadn’t been hit by the low pitch, Oceanside would have had a runner on third with no outs. Kalli Grover bunted back to the mound and Smith nailed Hatch at third on a very close play. Abby Veilleux hit a grounder to second and was called out at first on another close play before Smith made a nice running catch on a soft popup to end the threat. “This is exactly how I thought it would go,” said Oceanside coach Rusty Worcester. “These are the two best pitchers in the league. “I thought it would come down to which team made a mistake or which one would come through with a big hit,” said Worcester. And it was Brown who got that big hit. Olivia Albert hit two singles for Old Town. Casey Pine lined a sharp single to the left of Old Town shortstop Albert in the seventh for Oceanside’s only hit.